To American eyes the classical architectural tradition has its roots in an ancient Europe that is somehow apart from the natural world. The work and teaching of Dimitrios Klitsas reconnects us to the natural origin of the classical orders. 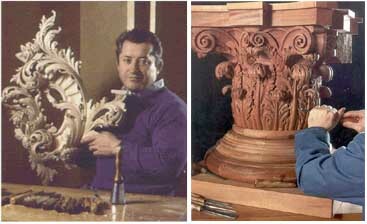 On the right is a Corinthian capital and on the left the master carver holds a wild, flourishing acanthus sconce. Photo courtesy of Dimitrios Klitsas. Expressive ornament is risky to execute whether it is architectural or a tattoo. It had better be well conceived or it will not wear well. According to Guild Member Dimitrios Klitsas, master wood carver, the piece is an expression of the patron, not the artist. In performing a commission, the artist’s task is to synthesize the client’s vision and to extract it from the wood in a classic, enduring form. This outcome is best assured in a direct collaboration between patron and artist, without undue intermediation by design professional, contractor or woodworking artisan. “The client will have to live with it their whole life”, he says “to make them happy it needs to come from the heart.” If the client is in a hurry or intent upon delegating all matters of taste, Dimitrios suggests that she would be better served by some of the clever and handsome mass produced ornament which is readily available in catalogs. The art of a master is less likely to fit into a construction schedule and more likely to test the limits of the client’s patience and willingness to engage. For a client who knows exactly what she wants the process can be simple. A patron with professional expertise in period furniture recently commissioned a table in the French Baroque, stipulating only that the design include no figures, a form typical of the style but not to her taste. From their discussions he produced one full, detailed front elevation of the piece, on paper, which she accepted, without changes. To insure that he got exactly the table he wanted, he built it himself in his own woodworking shop. Dimitrios emphasizes that he knows of many very accomplished furniture makers in the country today but that he feels the particular skill of joining work with the swooping lines of the Baroque is not widely practiced here. The material is basswood, a smooth grained hardwood which readily accepts the undercuts necessary for the exuberant detail the period requires. This particular carving took twenty months to complete, with deliberate rest periods intended to allow the artist and the work to absorb the changes and maintain their direction. He noted that since carved work emerges in three dimensions, it creates a multitude of viewpoints, all of which the artist must address. Not every client possesses such clarity and ambition as the patron of the Baroque table. How can a less knowledgeable client justify the expenditure when a workmanlike approximation can be had for a fraction of the cost? Dimitrios answers, “Woodcarvings look new every time. You can never look enough. They surprise us and delight us again and again.” Is that because a carved piece changes from each of the many of vantage points? He points to a deeply undercut rose in white oak. The painstaking undercutting of the wood carver’s art multiplies these vantage points and helps to give the work an active, living presence. The goal of training in the classical tradition, he says, is the artful depiction of the natural world. He displays as showpieces two classical architectural details, a bracket and a capital, both bearing flourishing, animated acanthuses, in basswood. 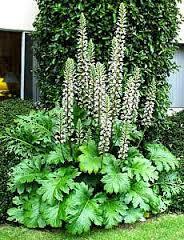 Nearby stands a free standing acanthus, waving slightly in a breeze, also in basswood. Rosanna Coyne, his assistant and long time student, left her work to come over to comment. “What we learn is how to see. I notice something new here almost every day even though I have been walking by these pieces for months or years,” referring to the many works in progress lining the walls. There are pieces within these pieces that have yet to be seen, even perhaps by the artist. In order to effectively employ the woodcarver’s art, Dimitrios recommends that the client visit him at his studio. When I visited, he and his assistant were working on identical Georgian laurel leaf freize ornaments in mahogany. Around the studio were numerous pieces in progress, shelves of art books and, in an adjoining room, rows of student benches pushed up against the wall. His studio is a school as well as a busy production studio (see Learning Traditional Woodcarving from a Master) and there is an atmosphere of excitement about producing art. The question that he wants to ask the client is simple, “What do you like to see? What in the natural world do you turn to for happiness?” A visiting client had built a modern timber frame home and knew only that they wanted to put a small touch of ornament in the massive slab of white pine over the hearth. With Dimitrios, they looked at pictures of the house, its setting and its materials and talked about what it meant to them. Vines were suggested, but in the end they decided on a single pine bough bearing cones as being more fitting. By learning about the client’s taste in an environment where the carver’s art can readily be understood, Dimitrios is confident that his commission will fulfill its purpose, to furnish enduring delight. Your building project is right on schedule and the interior trim is finally going in and the client suddenly gets excited. He has some money left in the budget and says wouldn’t a little carved ornament look great in the mantel or around the doors? Stop! Certainly it would but there is something he needs to know. The production cycle for this work can be lengthy and the time for planning was early on, when the foundation was being dug, in order to schedule a timely delivery. This entry was posted in Fine Art, Furniture and tagged Massachusetts, Sculpture & Wood Carving. Bookmark the permalink.